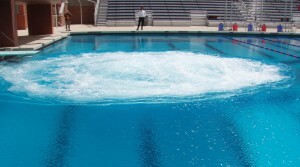 Pulsair’s presents the pool bubbler sparger System or air cushion landing system®. Extraordinary technology that provides an instant air cushion for springboard. As well ad a platform divers to land in when attempting to throw new dives routines in practice. The compressed air bubbles released through diffusers on the diving well floor. Because of this the pool bubbler system provides a soft pillow type landing of air and water minimizing the diver’s water entry impact. Now, Divers have more fun and gain confidence when they can focus on their routine and not worry about potentially painful water entries. Answer: Compressed air is released underneath an embedded or portable diffuser system located on the pool well floor. The rising bubbles soften the water landing for divers throwing new dives. The softened water reduces the surface tension and allows the diver to safely enter the water without injuring him/herself. Answer: The cost of the Puslair SoftWater Landing System depends on the number of platforms and the type of platforms (springboard vs. platform). Pulsair typically costs less then similar systems on the market. What is included with a Pulsair SoftWater Landing System? Answer: A typical Pulsair diving bubbler system includes a complete air compressor system, valves & regulators, touchscreen controller, hand-held remote and air diffusers. How much SCFM does they system consume? Answer: The number of diving stations, type and injection times all determine the total or maximum SCFM. The operator has control over the pressure setting from the compressor and the time the injection valve is opened.